A new mental-health and research building at Seattle’s Veterans Affairs hospital campus will expand capacity to treat the growing number of veterans seeking care. 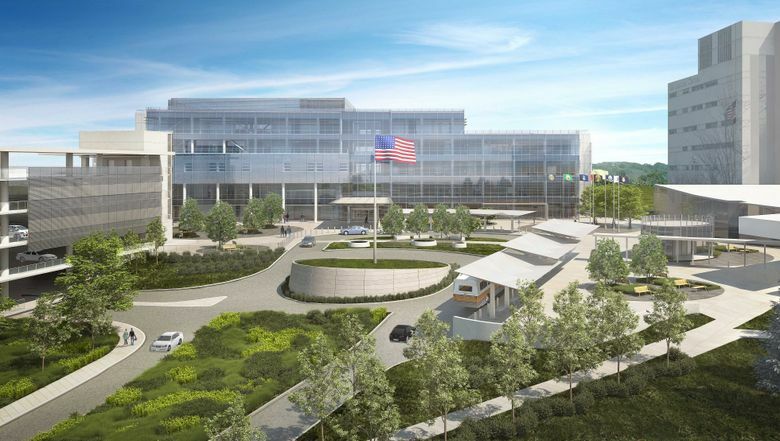 For the first time in nearly three decades, Seattle’s Veterans Affairs (VA) hospital campus is poised to expand, with construction of a new mental-health and research building set to start later this month amid a booming veteran population seeking treatment. By the time it’s finished in late 2017, the six-story, 219,000-square-foot building will house more than 250 mental-health staff members and 60 researchers and offer improved services for patients, VA officials say. “This comes at a time when we’re seeing a tremendous growth in the number of veterans in need of this kind of care,” Michael Murphy, director of the VA Puget Sound Medical Center System, said Wednesday after a groundbreaking event on the medical center’s Seattle campus on Beacon Hill. The $152 million project, which also includes a parking garage now being built, aims to advance mental-health research while providing the latest treatment services for veterans suffering from post-traumatic stress disorder (PTSD) and other mental-health problems, officials said. Nationwide, the number of veterans who sought care for PTSD from the VA more than doubled from 2003 to 2012, according to a report by the Institute of Medicine of the National Academies delivered to Congress last year. More than 650,000 veterans now receive disability pay for PTSD, one of the VA’s fastest-growing conditions with veterans returning home from wars in Iraq and Afghanistan. In the Puget Sound area, more than 22,000 veterans sought mental-health treatment last year at this region’s VA hospital system — an 8 percent spike over the previous year, hospital spokesman Chad Hutson said. Overall, some 97,000 patients sought health-care treatment of some kind last year from the VA’s Puget Sound system, an 18 percent increase since 2010. The last time a new health-care building was constructed at the Seattle campus was 1988, Murphy said. The region’s aging VA facilities create challenges for keeping pace with the latest methods to efficiently deliver health care, he said. Building more health-care capacity as more veterans turn to the VA for treatment is “critically important,” said U.S. Rep. Adam Smith, who joined U.S. Sen. Patty Murray and other lawmakers at Wednesday’s event. “We’re going to need more and more of these types of facilities,” Smith, D-Bellevue, said of the planned mental- health-care building. Once completed, the facility will seek LEED certification (Leadership in Energy & Environmental Design) for utilizing best “green” building strategies. Plans call for energy-efficient systems, two landscaped indoor courtyards, a grass-covered rooftop and a rainwater-harvesting system for irrigation. The construction project in Seattle comes amid troubled times for VA hospital construction nationally. Projects in New Orleans, Las Vegas, Orlando and Aurora, Colo., collectively have racked up more than $2 billion in taxpayer-funded cost overruns. The Aurora project, which is now more than a year behind schedule and $1.4 billion over budget, has become the single most expensive hospital in VA history. Despite those problems, VA construction chief Glenn Haggstrom received nearly $64,000 in bonuses while overseeing the projects. Haggstrom abruptly retired last week, with a lifetime pension, amid a brewing political firestorm.